This is an original G.O.D. production glorifying Srimad Bhagavatam through the navarasas, featuring the compositions of His Holiness Sri Sri Muralidhara Swamiji. It was first performed in Minneapolis on June 8, 2015 and will soon be performed in Houston on Dec 18, 2016. This is G.O.D.’s first original dance production. It presented Sri Radha Devi and Her unmatched love for Sri Krishna through the compositions of His Holiness Sri Sri Muralidhara Swamiji. This premiered in Houston in March 2014 and was later performed in Minneapolis, Dallas and Detroit. This was an original Western-Indian fusion music ensemble featuring about 60 artists including vocalists and Indian and Western instrumentalists. The music featured songs in multiple Indian languages as well as in English, composed by His Holiness Sri Sri Muralidhara Swamiji; and it also presented a universal song translated into and sung in 16 global languages. The presentation was directed by Vidushi Smt. 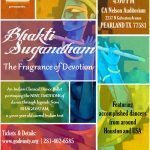 Rajarajeshwary Bhat, and performed in Houston in November 2015. 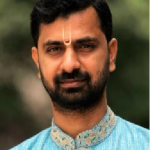 Concert Series of HH Sri Sri Muralidhara Swamiji compositions by accomplished Carnatic artists, held over 7 weeks at Atlanta in March-April 2016. Gopa Kuteeram children perform throughout the year in Atlanta, Boston, California Bay Area, Dallas, Houston, Virginia, Raleigh, Seattle, Minneapolis and many other cities. 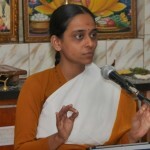 This unique art form weaves together story-telling and classical music to creatively present stories and learnings from ancient Indian scriptures, history and from the lives of saints. G.O.D. encourages children across the US to actively learn, pursue and perform this beautiful art. Actively performs in fairs, festivals, birthday parties and other celebrations in Seattle, Houston and other cities. Promotes the art of Rangoli in Seattle, Minneapolis and other cities.